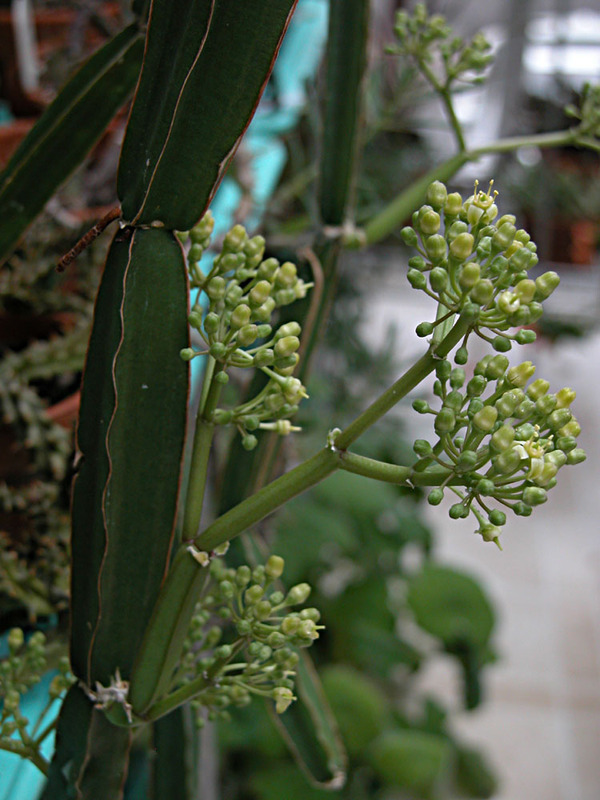 The invasion of the "potted up Cissus cactiformis" started about eight years ago. A harmless looking rooted segment had followed me home from a trip to the nursery. It looked interesting, just sprouting new growth. I learned through the years that this plant grows like a weed. 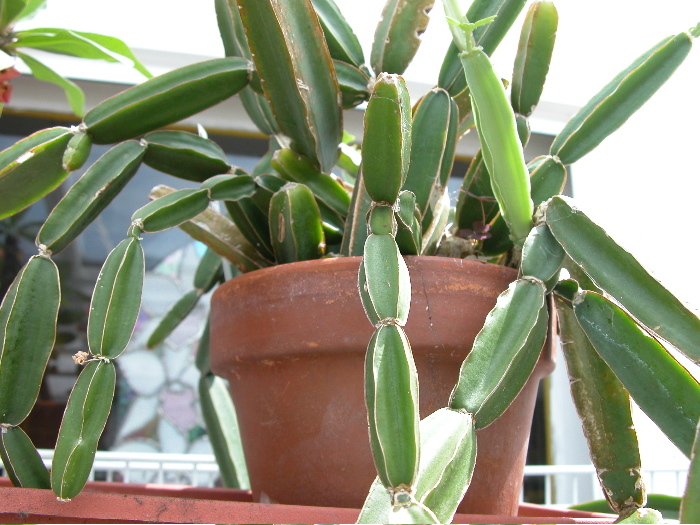 It climbs, holding on to most surfaces with strong tendrils which emerge together with a single leaf at each internode. The pieces break off easily and root in a flash. The pots/baskets holding many segmented plants multiplied and got larger, but I was always waiting for flowers. I had read about the 4 - 5 inch flowers, but nobody seemed to post a picture of them. So stubbornly I kept the plants going, waiting! Last Fall I had to pry the tendrils off the cage in our backyard, they grew so nicely over the Summer, still nothing. I took the plants inside, placed them into full sun and hardly watered at all. For the first time they approached dormancy, the segments were still plump, but they stopped growing. Finally - this Spring one of the smaller plants started growing several flower clusters, emerging from the internodes!!! This was getting really interesting! I waited for the individual flowers to develop so that I could take a decent picture. When I realized that each individual flower stays only open for a few hours, I got out the camera. It should be said that these flowers belong to the "Mealie - Magnet - Family", the clusters needed to be inspected on a daily basis and washed with a clean stream of water from a well aimed nozzle every so often. Those tiny droplets of moisture always appear along the stems of new growth. And here are some of the clusters, they measure 4 - 5 inches, as promised in my book on succulents.... greenish with a touch of yellow, if one looks closely. 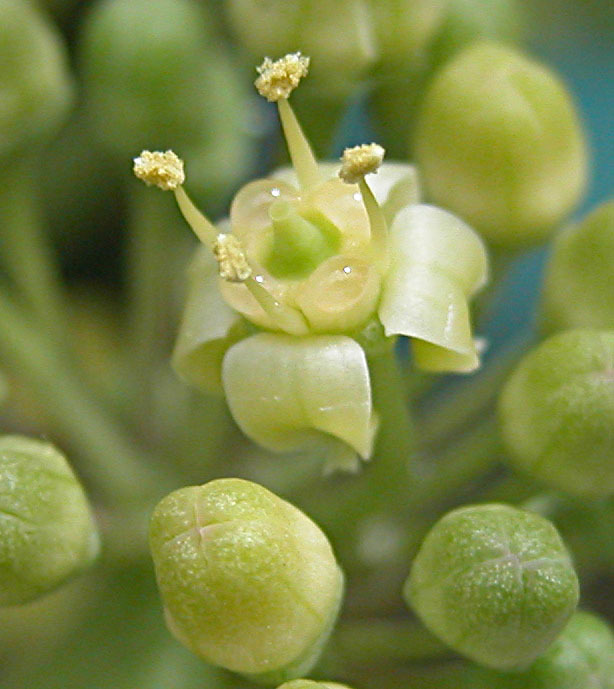 The individual flowers are 3 - 4 mm in size. those shiny dots are again the same little moisture droplets as described above. 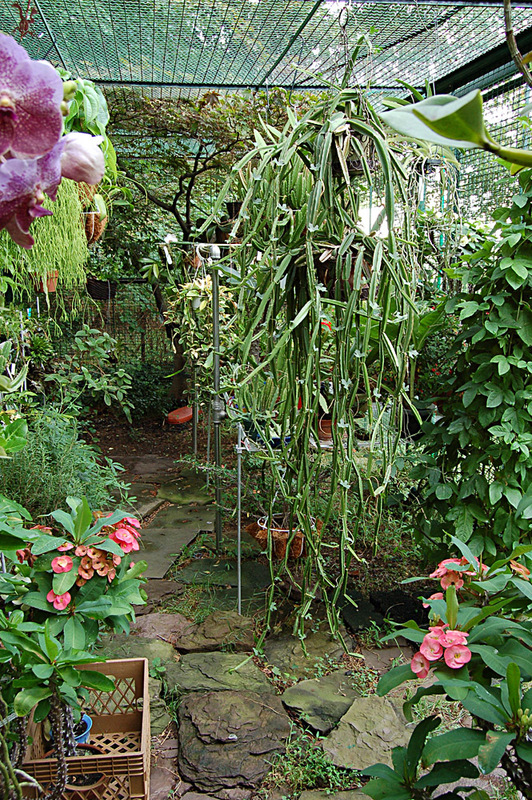 I had moved two plants into a double hanging planter in Spring 2005. This is what it looks like a year later, growing somewhat rampant.